The Peterson Home ~ 863 Kildare Rd. Mac Peterson has lived in her stately Kildare home for forty-one years. 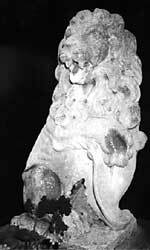 The stone lions that guard the front door were purchased years ago in London, England during a trip taken with her husband, the late Dr. Con Peterson. The Peterson's were the fourth purchasers of the spacious home. Mac and her doberman Thor have no intention of leaving the house that holds so many memories for her. In May, she shared some of her early recollections of Walkerville. "In the 30's and 40's life revolved around Willistead," recalls Mac. "In the winter, there was always lots of snow and it was always cold enough for the tennis court in the park to be flooded for ice skating. In the warm months you would play tennis and other games. I grew up at 1065 Chilver in the house my grandfather, Frank Moore, built in 1922. My mother could keep an eye on me playing in the park from the front porch. I would usually ignore her calls to get me home so one day, she resorted to using a police whistle. I was so embarrassed! We also loved roller skating around the neighbourhood. We usually avoided the streets around St. Mary's Church because of the cobblestones!" "I went to King Edward and then Walkerville. We knew spring had come when the Walkerville band started up! During the war, all the male teachers enlisted. The female teachers stayed behind - they did a great job! They were very firm and had good control over the students. The students were very patriotic and the halls were jammed with all the metal collected during the metal drives. Beds, springs, pipes - you had to weave your way through it all! When the war was over, some of the male teachers returned. They were so military-like! They treated the students like little soldiers. One teacher held a male student out a third floor window by his armpits because he wasn't paying attention. His parents never knew. Parents were content to let the teachers do the disciplining and the reprimanding of the students. The only time parents came to the school was to talk about academics." "The electric street car from Walkerville to Windsor had either raffia or straw seats. They were woven and they made your legs prickle. During the war, most people walked, rode their bikes or took the streetcars to get around as cars were scarce. Even the principal of Walkerville rode his bike to work! I'll never forget the sight of all the men with their black lunch boxes walking in a steady stream to the factories and the lines of men with their empty lunch boxes walking the other way home." A retired nurse, Mac enjoys meeting with friends and spending time with her daughter Alexandra, and her three grandsons.